Conventional investment wisdom suggests that smart people, working diligently and informing themselves with the latest information, can pick undervalued stocks and time the market. Further, many believe that this kind of “active” investing leads to superior returns. Market timing and stock picking do not work – Wall Street and the financial media perpetuate the myth that they work because they stand to profit from people who believe it. The high cost of active investing means about 70% of managers are destined to underperform the overall market in any given year. Most managers achieving market outperformance do so simply by chance. The real opportunity to achieve results lies in establishing and adhering to an appropriate long-term investment strategy built on goal-focused, long-term financial planning, low-cost funds and disciplined rebalancing. Truepoint’s buy-hold-rebalance strategy has weathered all types of environments. 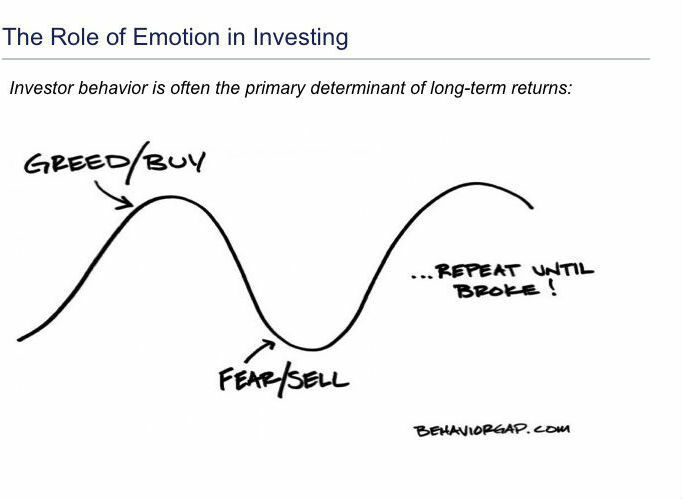 Our intellectually honest and fully transparent investment philosophy recognizes that the hardest work in investing is often emotional and that investor behavior can be the primary determinant of long-term returns.